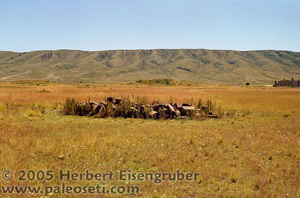 I urge everyone interested in the PaleoSeti theory to visit Tiahuanaco and the adjacent ruins of Puma Punku. There is lot's of "reconstructing" going on in Puma Punku in the last years, so it is not quite clear how long you can see the ruins in its current state. 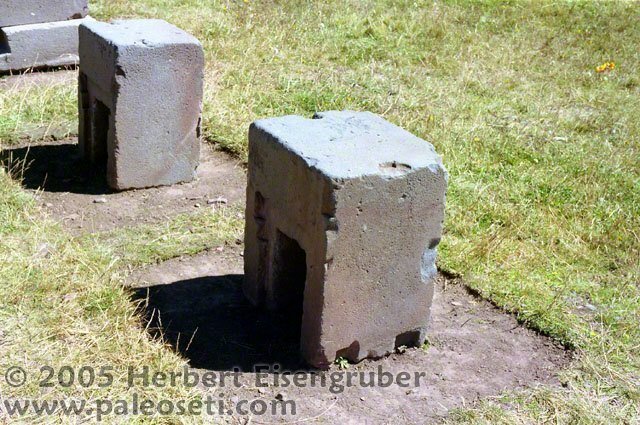 Don't let the guides tell you you can't visit Puma Punku. When I visited in 2005 I had to start a little "Tourist revolution" during my trip as the guides didn't want us to visit the site. But a little stubborness (and a few Dollar notes) helped. I had the impression the guides are instructed not to "encourage" tourists to visit the site. Why is that? 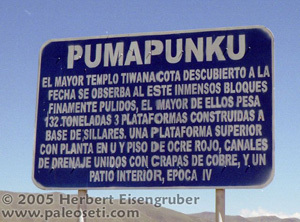 Well I think there are no "conventional" explanations regarding Puma Punku. Nobody has any answers if tourists ask "unconventional" questions. 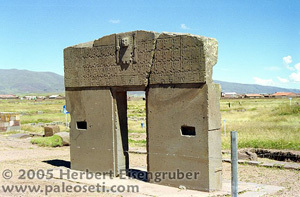 Update: My brother visited Tiahuanaco and Puma Punku in 2011 and reconstructions are already well underway. 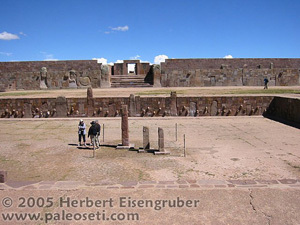 The site looks different now and it seems that many large blocks in Puma Punku have been moved. I'm glad that I visited the Puma Punku site in 2005 where it was pretty much the way since the year 1800. 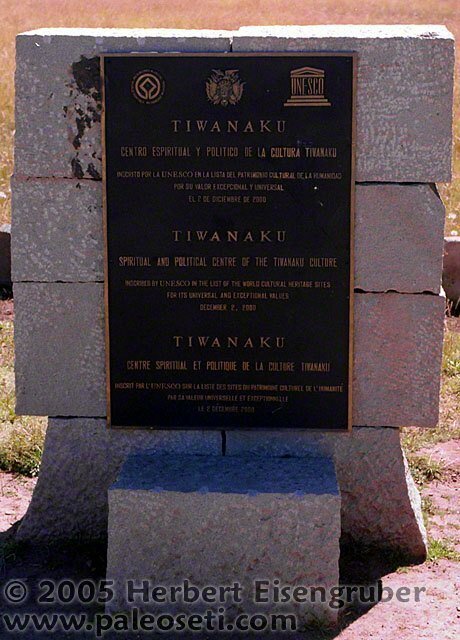 Unfortunately Tiahuanaco is the "victim" of horrid "reconstructions" within the last 100 years. 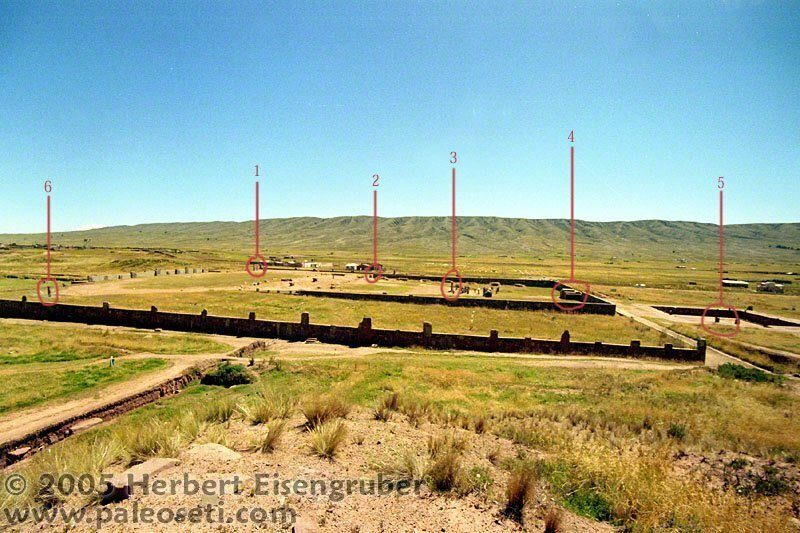 Nobody ever knew how the site really looked like and it seems that many "reconstructions" were made just so there is something to show the visitor. Walls have been put up without ANY indication that there ever was one, stones have been put on top of each other - or side by side - that are clearly not meant to go together. 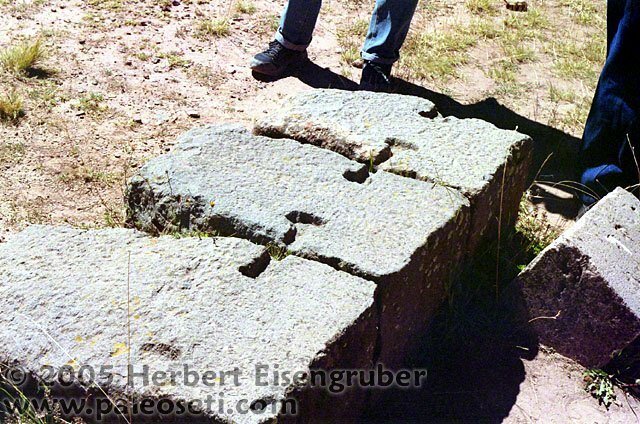 Ather stones or artifacts have been ripped out of context or placed where they obviously don't belong. E.g. 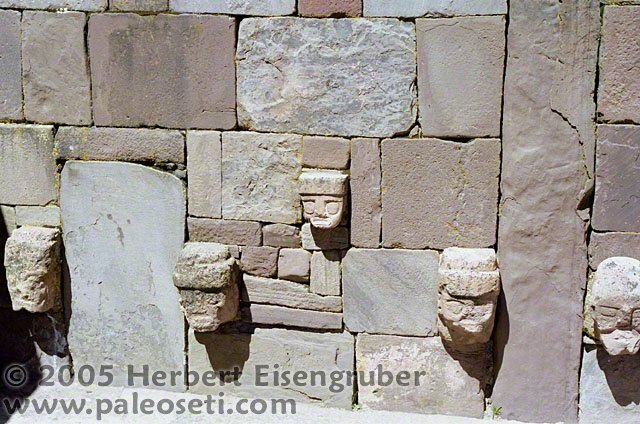 the faces and heads in the semi-subterranian temple are a complete fabrication of the "archaeologists" that slapped them there. 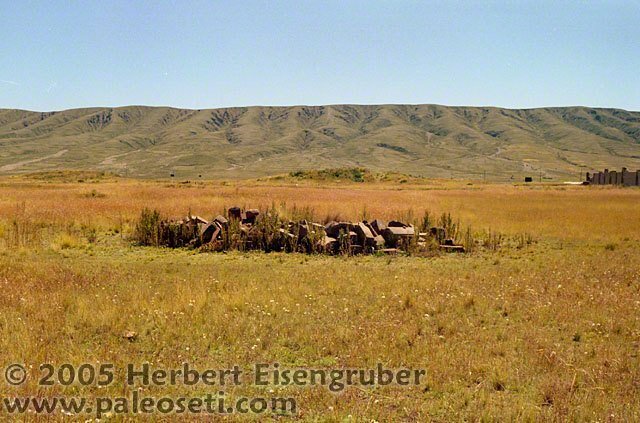 In recent years, controversial items that are discussed in PaleoSeti literature disappeared mysteriously. One example are the energy - pardon - water channels that Erich von Daniken photographed in the 1960s but disapeared shortly after that. 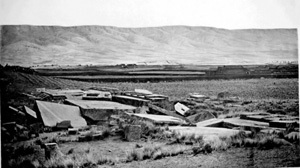 That's why I'm collecting vintage photographs dating back to the late 1800s that show Tiahuanaco and Puma Punku before all the reconstructions happend. Tiahuanacu is a "UNESCO World Heritage Site". 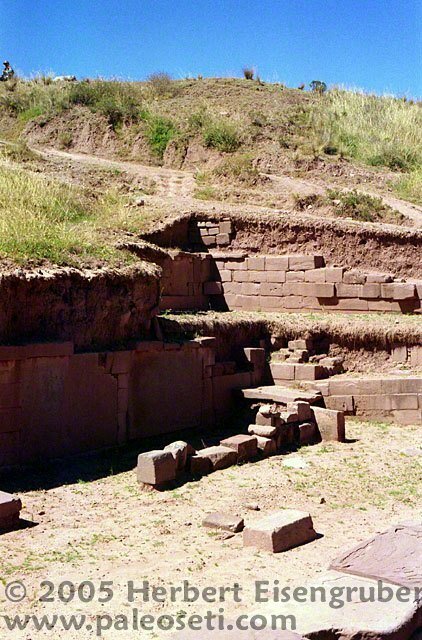 In the past hundred years the ancient ruins served as a source for stones to build houses for the local community and therefore are lot of damage was done to the site. There are delicately carved stones lying around everywhere piles and piles of them. 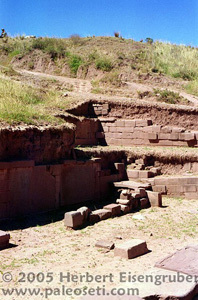 Right after you enter the site you will see how careless the archeologists worked in Tiahuanacu. Piles like those are everywhere. The carved stones are just thrown together without context, rhime or reason. Mysteriously carved stones are standing right and left on the path to the ruins. The archeologists just place them there, they haven't been there originally. Not far from the entrance there are these two lonely blocks. They must weigh many tonnes. It almost looks like they where thrown around by a big explosion or something. 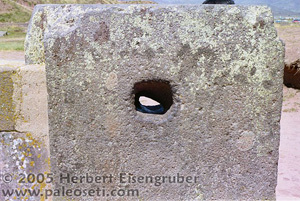 The blocks are carved with extreme precision - just like the most granit blocks in Tiahuanacu. 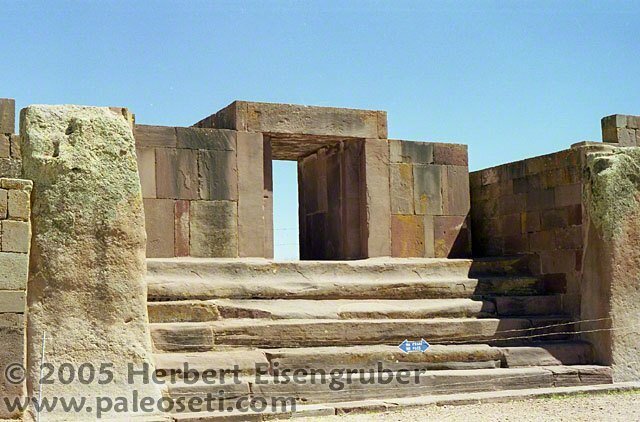 There two different types of building materials used in Tiahuanacu: Redish Sandstone and greenish-blue Andesit, a superhard type of granit. The much softer sandstone was used for "everyday" buildings. 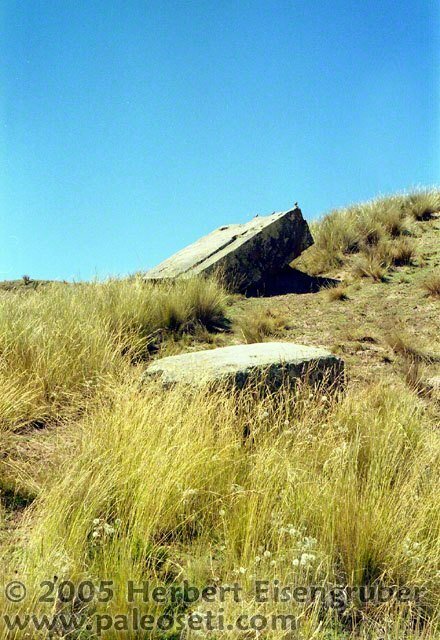 On this photo you can see the remnants of such a building. I made a separate page for it. Please click here. 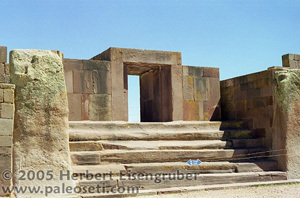 Here a closer view at the "semi-sub-terrenian temple". It's built with astronomical alignments in mind. 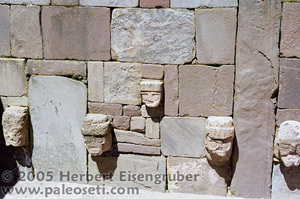 The heads in the walls (like pretty much everything else reconstructed wrongly, they haven't been there originally) show different facial and racial features. Most of them have modern looking helmets. Also a common trait are the square, robot-like eyes of some of them. 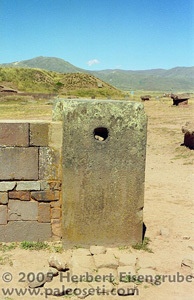 The reconstructed gate within the reconstructed wall. By the way that reconstructed wall that surrounds the part of Tiahuanacu called Kalasasaya is a total fantasy product of the archeologists. Nobody really knows how it looked and if there ever was a wall. 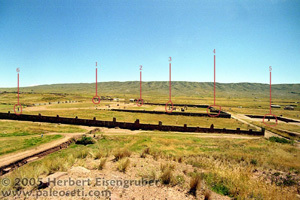 The earliest photos and descriptions of Tiahuanacu were made by Max Uhle and Stuebel in their book "Die Ruinenstaette von Tiahuanacu". All it shows are the big Megaliths in between the reconstructed walls. The reason I don't believe that there was ever a wall there is the fact that those big megaliths have carvings INSIDE were now the "reconstructed" wall is. In Tiahuanacu and Puma Punku one can often see blocks of granit, that were held together with metal clamps. You can see that in the photo on the left. This ingenius method was used by the ancients all over the world. Who were the teachers? Just a stone with a hole? But that hole is something special! 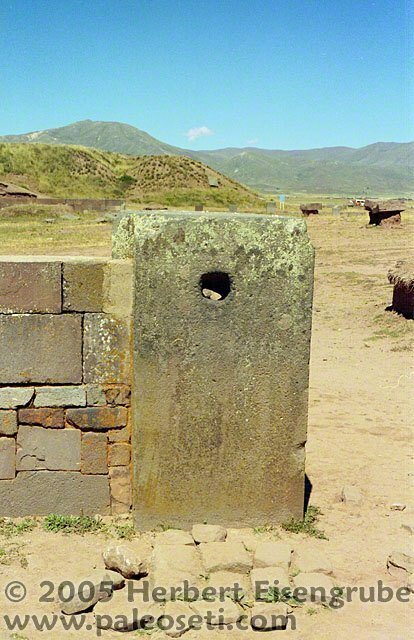 This monolith features a weirdly cut hole in its upper half. At first sight one wouldn't think much about it, but if you press your ear to this hole incredible things happen: Normal voices and sounds ca. 300m (yards) away are heard crystal clear, just like an amplifier! But that's not all. If one speaks through that hole the voice gets distorted. A man's voice will sounds very "robot" like. 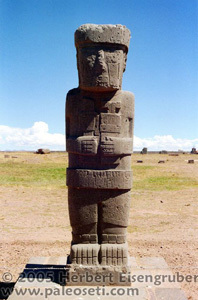 Here a closer view at this "accustic miracle" of Tiahuanacu. You can see how precise it was cut and carved. The accustic properties are not there by coincidence! Whoever made this had an incredible knowledge about physics and accustics.